Biographical documentaries of contemporary artists are legion these days, and even the good ones (like 2011’s Gerhard Richter Painting, 2005’s William Eggleston In The Real World, 2003’s Rivers And Tides: Andy Goldsworthy Working With Time) fall victim to a familiar form. 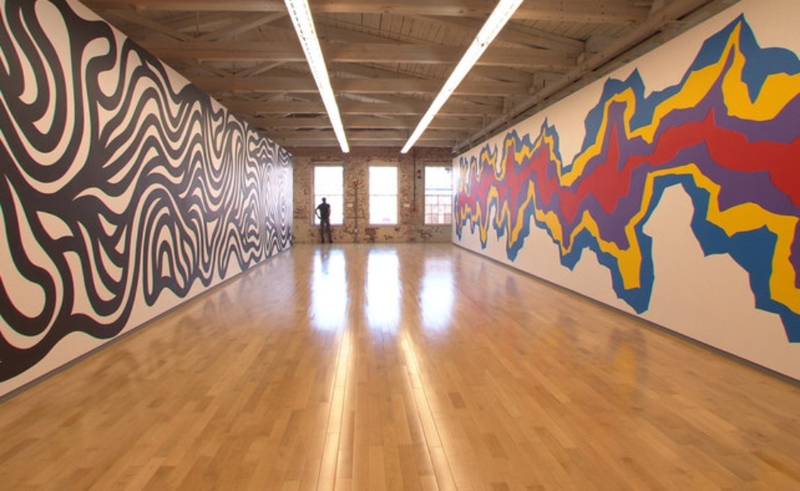 Oddly, Sol LeWitt benefits from the fact that its subject is dead and he eschewed interviews during his life. In the one audiotape of his voice that director Chris Teerink plays (wherein LeWitt has Woody Allen’s vocal pitch and stammer, without the thick Brooklyn accent), he says he lobbied to keep his photo out of his books, and blanched at the idea of appearing on panels. His specific use of the word “panels” is funny, since panels of a different sort are how he made his name in the first place. LeWitt was one of the major forces in mid-20th-century minimalist art, but his early work crossed over considerably with the groovier Op Art. His work is theoretical and intellectual, but also bright and fun. Teerink opens Sol LeWitt with a wordless montage of his paintings and sculptures—set to a marvelous score by Dutch ambient composer Rutger Zuydervelt—in museums and public parks. In just a few perfectly framed moments, the LeWitt effect adjusts all perspective. New York is one enormous LeWitt work—the blocky buildings and criss-crossing buses are merely planes, squares, and cubes on every conceivable axis. All it takes is a moment to look. Once Teerink successfully sets the stage, with none of the usual boring biographical or theoretical exposition, he dives into the specifics of LeWitt’s most conceptual period. Famously, LeWitt was among the minimalists who would forgo canvas or even paper, working directly on the elements of a given space. He created an enormous series of wall drawings that could be reproduced by anyone who had a pencil, time, and some room. Where other artists would sell work at auction to be crated away to collectors’ homes, LeWitt would fax a list of instructions. This may sound like a goof, but Teerink shows just how meticulous and technical the creation of these installations could be. Throughout the film, as he examines more work and features a few talking heads, the film observes the slow, arduous creation of LeWitt’s “Walldrawing #801” in a Dutch museum’s enormous cupola. The workers use tape, paint, precision, and a lot of backbreaking labor. The deceased LeWitt, on the other hand, just had the idea. Tom Wolfe’s short book on modern art, 1975’s The Painted Word, is in part a buildup to the argument that if an unknown, impoverished artist with a brilliant inspiration dips his finger in a glass of water, outlines his masterpiece on a napkin, then drops dead of a heart attack as his work evaporates before he can alert anyone, he has still created a major work of art. This may seem like just another tree-in-the-forest fallacy, but after enough time among these works—especially when they’re photographed this well—such heady notions of ideation-as-art begin to make sense. “[Discussions of] art taken out of the objects itself always sounds pretentious,” jokes Lawrence Weiner, an artist and friend of LeWitt’s, in the film’s lone moment of levity. Teerink’s reserved, spare form mirrors LeWitt’s work, which gives it tremendous impact. A walk through the Italian village of Spoleto, where the New York-based artist lived for much of the 1980s, shows old tile and bricks that, without much effort, take on a LeWitt-like resonance. Elsewhere, Teerink shows LeWitt’s site-specific work at the Columbus Circle subway station in Manhattan—colored floor tiles no different in size and shape from what’s found at every other platform, but manipulated just enough that some busy commuters will notice them. These quiet passages are cut together with only minimalist soundtrack music. Teerink clearly approached his biography with a What Would Sol Do attitude, a subtle approach that demands a little work from viewers. The rewards are abundant.